The Lambeth Cyclists architecture rides continue to attract lost of interest with LCC members from neighbouring boroughs often joining us for the short cycles around the varied architecture of London. 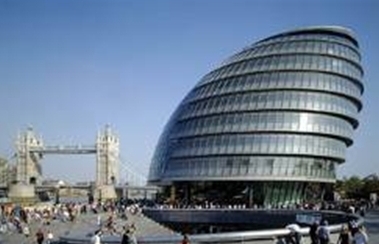 In February 2005 Barry Mason of Southwark Cyclists led a ride to examine Norman Foster’s 20th and 21st century buildings. About 15 cyclists braved the early snow to take in many of Foster's works including City Hall, Tower Place, the Swiss Re Tower (aka the Gherkin), the Great Court at the British Museum, Sainsbury’s headquarters, the Millennium bridge, Aspreys and numerous other Foster buildings before finishing up at Canary Wharf tube station where Roger Seaward had organised for us to see the depths of the tube station normally not open to the public. Thank you to Barry for leading this ride. Our next ride is due to take place on 19 March and will be led by Benedict O'Looney, a keen cyclist and practising architect. He is promising to take us on a tour of the Queen Anne style architecture Shaw is noted for including New Scotland Yard on Victoria Embankment, Albert Hall Mansions, St. Michael and All Angels Church and the Savoy Theatre. We hope to arrange architecture rides in April and May (probably towards the end of the month) but at the time of going to press we were still finalising details – look out for information in the Lambeth Cyclists website at www.lambethcyclists.org.uk. If you would like to lead a ride on a particular architect contact Janet Paske (email janet@jpaske.freeserve.co.uk) – we are open to all suggestions and you don’t need to be an expert on an architect to lead a ride!